On May 7th 2000, outside a Ramada Inn in Jacksonville, Florida, a vacationing couple, James and Mary Ann Stephens, were accosted by a black man with a gun. Within seconds he had shot Mary Ann Stephens in the face, killing her instantly. He ran off with her bag, which contained her purse (which had around $1200 inside it), and other items. The murder took place at approximately 7:30 in the morning. A description of the assailant was broadcast to police vehicles in the area, with the warning that he was likely to be armed and dangerous. Around two and a half hours later, fifteen-year-old Brenton Butler was stopped by two officers in a police cruiser; he was on his way to a local Blockbuster Video store to drop off a job application. He was taken to the Ramada Inn where James Stephens identified him as the man who had killed his wife. 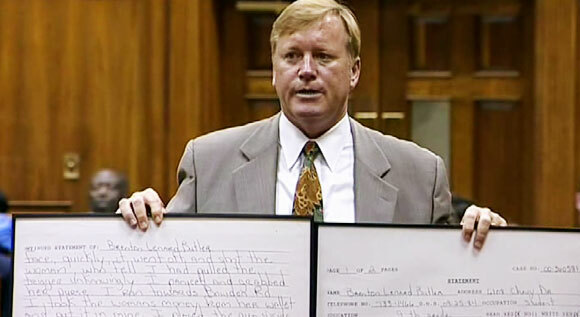 Butler was duly arrested, and during his questioning by the detectives assigned to the case, he signed a confession. 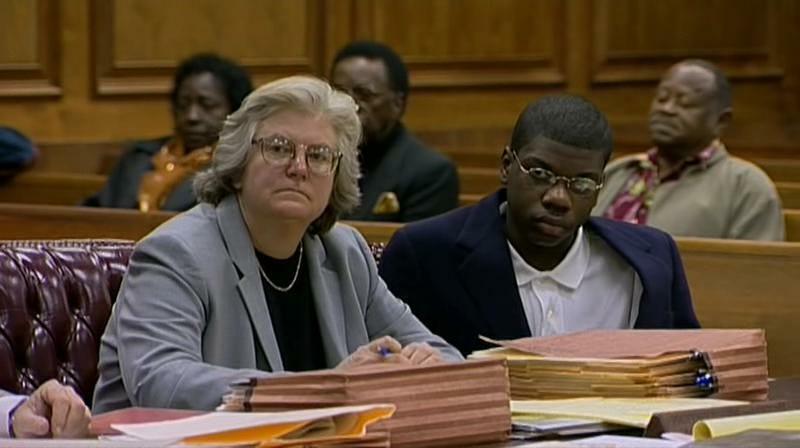 The case went to trial later on in 2000. An open and shut case, yes? Certainly the Jacksonville Sheriff’s Department thought so. Thanks to James Stephens and the certainty he showed in identifying Butler as the killer, the police looked no further than the teenager they had in custody. Not so surprising you might say. And you’d wouldn’t necessarily be wrong. 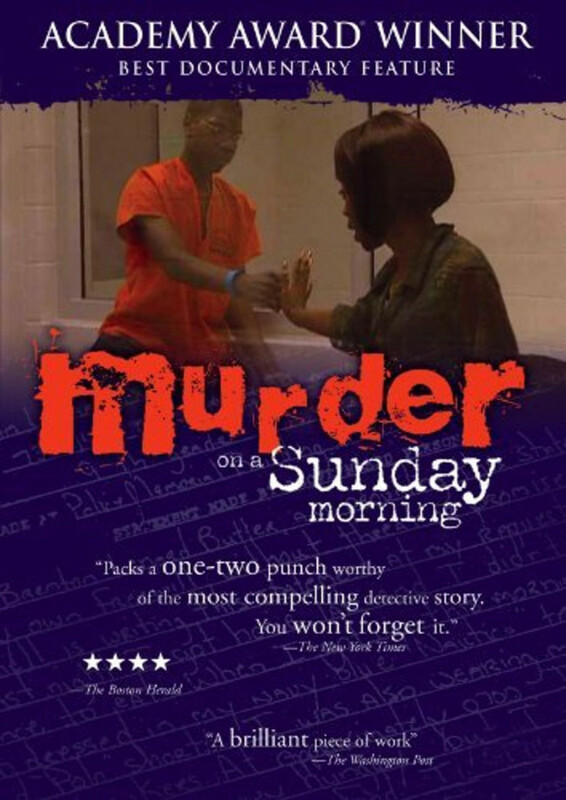 But Murder on a Sunday Morning highlights the dreadful way in which the detectives on the case, James Williams and Dwayne Darnell, along with a colleague, Michael Glover, did nothing to properly investigate the case, but did all they could to coerce Butler into making a confession (which, in reality, he never did). As a miscarriage of justice, it’s frightening. As a cautionary tale about the perils of “swift justice” it’s also alarming. As a vindication of “the best legal system in the world” (a direct quote from the trial judge, Wendell Waddell III), it’s on shakier ground. This is a case that should never have gone to trial. The police knew they didn’t have a case, the State Attorney knew they didn’t have a case, but the trial went ahead anyway. Thank heavens then, for Patrick McGuinness and Ann Finnell, two lawyers appointed by the Public Defenders Office to represent Butler at trial. It didn’t take them long to realise that the prosecution’s case was flimsy, and it didn’t take them long to work out a strategy for Butler’s defence that would be effective in exposing the police investigation for what it really was: non-existent. And thanks to Jean-Xavier de Lestrade’s excellent documentary, we can see how McGuinness and Finnell took on the prosecution’s case and dismantled it piece by piece. de Lestrade and his French crew were there from the time McGuinness and Finnell were appointed, all the way through the pre-trial period as they made their own enquiries, and then at the trial itself, recording the key exchanges that highlighted the police’s laissez faire attitude and their unwillingness to mount a proper investigation. The movie adopts a straightforward, linear approach that allows the viewer to become increasingly involved with the case and the trial, and with Butler’s family as they try to come to terms with the enormity of what’s happened to their son. The courtroom scenes are mesmerising. McGuinness is like a quietly spoken pitbull, prodding and poking at the detectives and getting them to admit to their own inadequacies as police officers. Away from the courtroom, the chain-smoking McGuinness reveals his disdain for the detectives, and points out that if he has no respect for a police officer then he won’t address him by his rank; McGuinness wants that officer to be annoyed, to become antagonistic perhaps, because then they’ll trip themselves up and make his job that much easier. He doesn’t have to worry, or put so much effort in. Williams and Darnell and Glover – they do all the work for him. Their complacency is his best weapon. As well as its linear approach, the movie is free from any frills or unnecessary embellishments, and it’s this plain and simple way of addressing the material that makes Murder on a Sunday Morning such a compelling documentary. When the story is this good, you don’t need to make it overly dramatic or accentuate certain points to be effective, and de Lestrade is wise enough to let the story tell itself. As the depth and breadth of the police’s ineptitude is revealed, the viewer is likely to be shaking their head in disbelief and wondering how on earth Butler’s arrest and subsequent trial could have been allowed to happen in the first place. But de Lestrade and his team show you exactly how it happened, and why (hey, let’s make sure this murder doesn’t affect the number of tourists that visit each year), and they also ensure that nothing is either lost in translation or through Ragnar Van Leyden and Pascal Vernier’s rigorous editing. Each point that the defence raises in opposition to the prosecution’s case is recorded precisely and with as much impact as possible. By the time the trial reaches its conclusion and the jury retires to consider its verdict, the movie has delivered a crushing blow to anyone who may have believed in law enforcement officers as fair-minded, dedicated, and professional (at least in the Jacksonville Sheriff’s Department). In exposing the failings of a murder investigation, and the officers who put more effort into railroading a fifteen-year-old into confessing to a crime he didn’t commit than they did looking for someone else who actually fitted the description James Stephens gave them originally, the movie proves compelling, gripping and powerful. And when the trial is over and the verdict is in, the movie has one more ace up its sleeve, a postscript that provides further evidence of the incompetence of the police.